What is the point of fishing when you can’t brag about the size and the weight of the catch? For most anglers, weighing the fish is one of the most important parts of their fishing adventure. 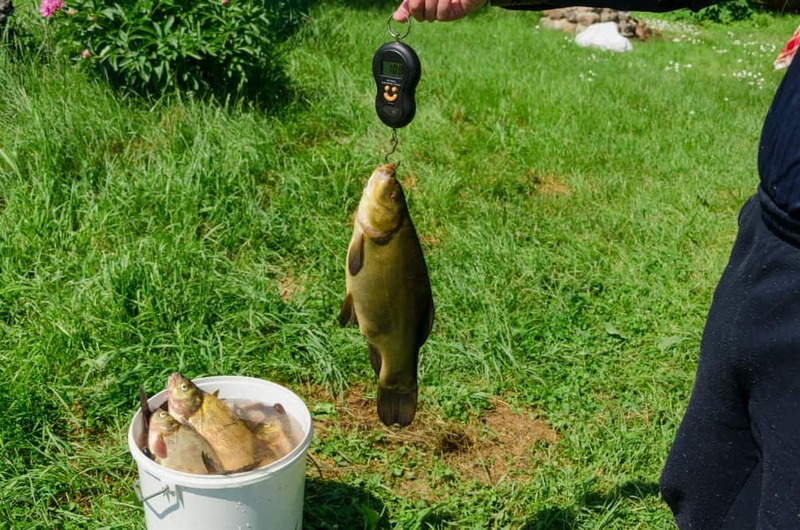 If you are taking part in a tournament, weighing your fish correctly becomes even more important. However, if you are using a hook scale, you first need to learn how to weigh a fish with a hook scale. Hook scales are now becoming popular among anglers as they are easy to carry, easy to use, and require less storage space. The modern hook scales come with digital screens too, which ensures accurate and reliable measurements. However, using the hook with the fish is a challenging task, especially if you are new to the use of a hook scale. If you are worried about how to use it, don’t worry anymore. In this article, we will provide you with complete details about the use of a hook scale while weighing a fish. The use of the hook scale depends on the type of hook scale you are using. For instance, if you are using a digital scale, it would be different as compared to when you are using the traditional scale with a dial. Let’s first begin with the use of a digital hook scale as they are becoming more and more common. To begin with, you have to look for the button that will put the scale to the zero pounds or zero ounces. You need to reset most of the digital scales to zero after each use. In most cases, there is a specific reset button, while for some, you need to press the power button for two to three second to reset the scale. Once you are sure that the digital scale is now set to zero, the next is to set the measurement unit you want to measure your fish in. Most digital scales allow you to choose between the pounds or ounces and kilograms or grams units. You can do this by pressing the power button for a few seconds as the scale allows you to cycle between the units, while some also have a separate button for this purpose. To weigh a fish, simply hook the scale weight hook right under the gill plate of the fish. You also have an option to hang the hook from the lure, in case it is attached to the lip of the fish. While weighing the fish, you also need to make sure that you are lifting it off the ground completely in order to get precise weight measurement. Give it some time to adjust the weight on the digital screen. It may take one to two seconds to calculate the steady figure. You can also weigh more than one fish using scale hooks. For this, you can use a container that you can hang on the hook or a sling. You can put all the fish in the container. Most modern digital scales will provide you with total weight as well as an average weight. In many of the latest digital hook scales, you also have an option to store the weight in the device’s memory. In this way, you can also weigh each fish separately and then add their weights later. Use a damp sling to weigh the fish on the dial scale, as it has weight and makes it easier to zero the scales. Hang the empty sling onto the hooks and zero in the dial scale. Remove it and place it again to see if you have the correct zero reading. Put the fish into the sling while making sure no water accompanies it to the sling. Hold the scale up using a weighing rod. If you have more fish to weigh, you may have to write the weights down to add them up later. Unlike digital hook scales, you can’t save the readings on the dial scales. And, that’s it! The process is very simple, but you need to take some precautions to make sure the readings are accurate. First, don’t hold the weighing scale from the sides. Instead, hang it in your hands from the top. Holding from sides will give you a false reading, especially when you are using a dial scale. The best practice is to use a weight rod or a tripod to hang the scale. When you are using a sling when weighing fish, make sure there is no water in the sling. However, you have to make sure the sling is damp when you weigh it. Don’t let it dry completely. Also, make sure to weigh the fish out of the wind as a strong breeze can put extra weight on the sling or container, which can affect the actual readings. Make sure to reset the digital scales every time you weigh a fish. Many new anglers in their excitement of catching a fish forget about it and have completely false readings. It is not recommended to use a landing net to weigh the fish, as it will also add the weight of the landing net to it. Even when some landing nets come with a handle to assist anglers to hang it on the hook, it is considered a bad practice. Similarly, weighing in the plastic bag is also not recommended by professional anglers, mostly because it is almost impossible to zero the dial scales accurately. Weighing a fish on a hook scale is not that difficult, but when it comes to getting precise and accurate readings, you have to look into things carefully and avoid some mistakes. We have listed both the methods for the digital as well as dial scale to make it easier for you. In addition, we have also listed some of the do’s and don’ts of weighing a fish on a hook scale that can help you get precise readings. We are sure you have now learned how to weigh a fish with a hook scale. All in all, hook scales are not that challenging to use, but make sure you have the necessary accessories with you as well, like a weighing rod and sling. Happy fishing!